Please click here or on the image to view URBANEXUS Weekly for November 9, 2014. Please click here, or on the image to view URBANEXUS Weekly for October 19, 2014. Please click here, or on the image, to view the URBANEXUS Weekly update for October 12, 2014. Please click here or on the image to view URBANEXUS Weekly news on natural and built environments for October 5, 2014. Please click here, or on the image below, to view the URBANEXUS Weekly of September 28, 2014. Please click here or on the image to view the update posted on September 14, 2014.
for the URBANEXUS Weekly of September, 14, 2014, please click here or on the image below. Please click here, or on the image, for Natural and Built Environment Weekly of August 17, 2014. Please click on this link or image below to access Natural and Built Environments Weekly for August 10, 2014. 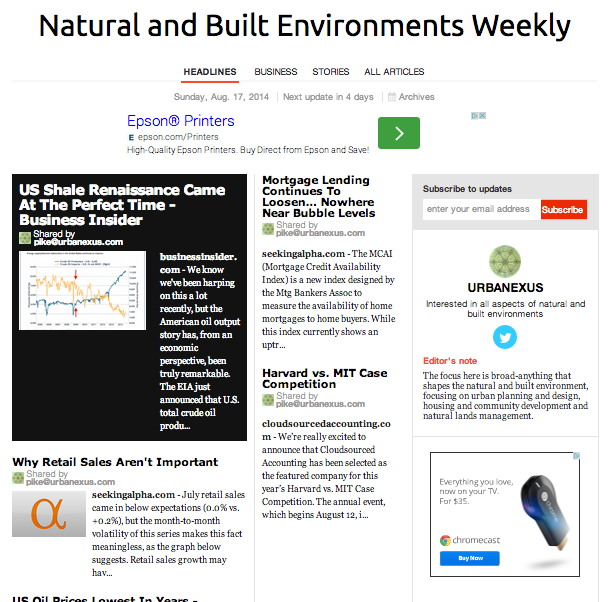 Click here or on the image to access the Natural and Built Environments Weekly for August 3, 2014. Please click here, on the image, to access Natural and Built Environments Weekly for July 27, 2014. Please click here, or on the image, to access the Natural and Built Environments Weekly of July 20, 2014. Please click here or on the image to access Natural and Built Environments Weekly for January 13, 2014. Please click on the image to access Natural and Built Environments News for July 6, 2014. Please click here or on the image to access Natural and Built Environments Weekly for June 15, 2014. Please click here, or on the image, to access Natural and Built Environments Weekly for May 25, 2014. Please note the change in the title of this weekly news posting. As the revised title suggests, the focus is now even broader than before--anything that informs preservation of natural environments and creation of built environments. Please click here, or on the image below, to access the Land Use and Real Estate Weekly update of May 18, 2014. Please click here or on the image to access the Land Use and Real Estate Weekly update as of May 11, 2014.